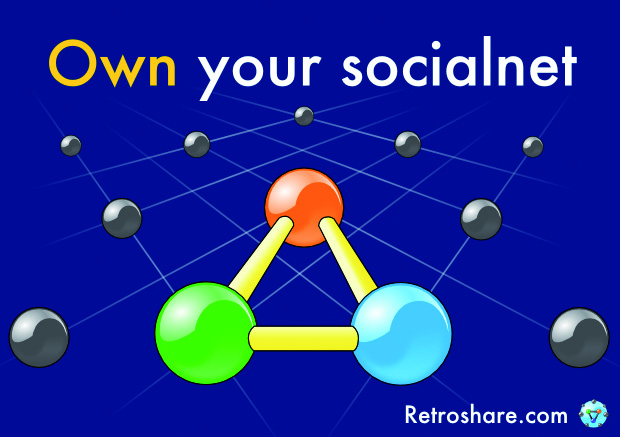 Retroshare development is still active, with ever growing numbers of developers and users. 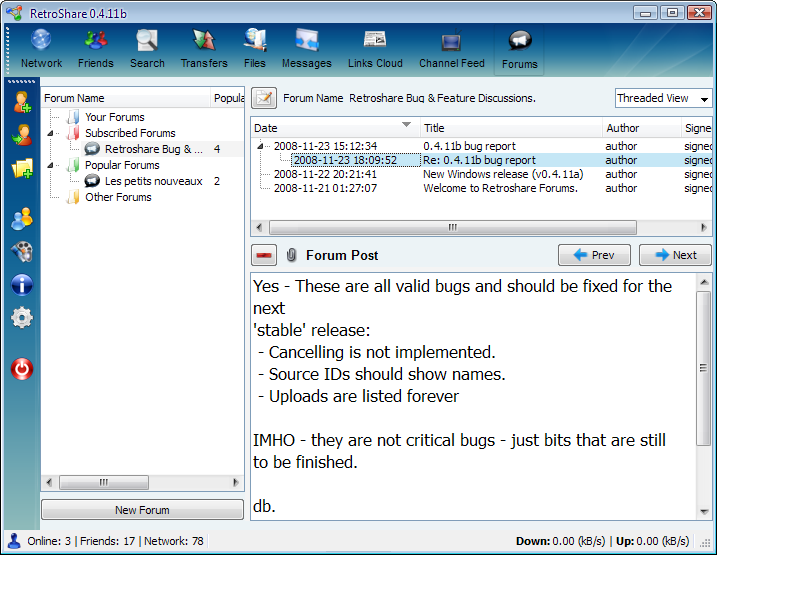 At this point (April 2009) we've had over 50,000 downloads, and are soon to release version v0.4.13. Version 0.3.0-pr5 has been placed on the web. This is the first Qt4.0 gui, and is a lot more user friendly than the FLTK gui. This of course came at a cost... lots of hours, and lots of pain trying to get cygwin + retroshare, pthreads, mingw + Qt4.0 all working together. (and 5 times bigger). But its Done!. 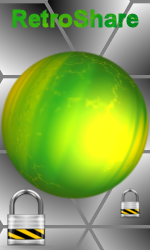 This is Pre-Release5, alternatively known as rc1. Please test, and report back. New GUI is functioning... Took a while. But got there in the end. Crypton joins the team, bringing in beginning of Qt GUI, and starting the push towards a new interface. This will a couple of month process, as everything gets bashed around a bit. Version 0.2.0rc4 has been placed on the web. This version brings the following new features: - First release with Web of Trust Authentication! - Downloads are automatically resumed - New Directory search interface. 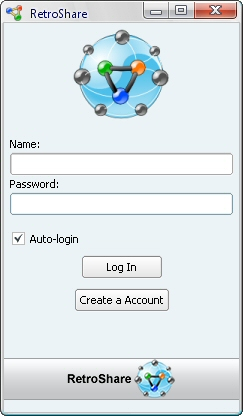 When you first run RetroShare, the Login Window is presented. Existing user: then just enter your password. New User: Follow the instructions below. 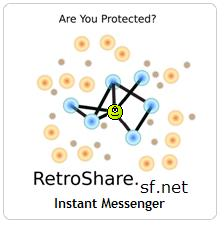 Click "Generate Request", and retroShare should start up!. If there is an error, a window will pop-up with instructions on how to fix the problem. Monitor the Connection Status of all your friends - displayed in the upper window. Enable/Disable each User's Access via the Check Boxes. 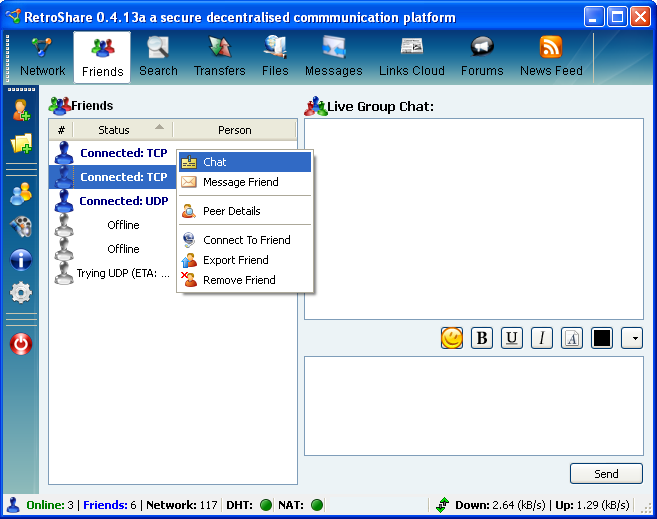 The Status Column shows which people are Connected, or Offline. For more Information/Configuration of a Peer, select their certificate, and the press the "Configure Certificate" Button on the right-hand side. Remove a Person from your Trusted List is done by selecting them from the list, and then clicking on the "Remove Person" Button. They will be moved to the lower, untrusted list. 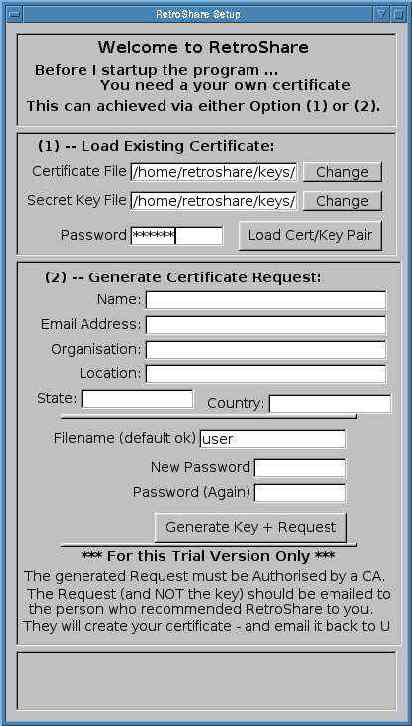 To Add a new Person: Either select their Name in the lower window and then press "Add to Friends", or Add their Certificate, via the Load Certificate Button on the right-hand side. The Certificate will appear in the Trusted Window. Check the AutoConnect button to enabling sharing with them. This allows you to Search the currently connected Peers. Enter the phrase in the top field, and press the search button. As the results come back, they are displayed in the window. To Download, Select the file, and press the button. 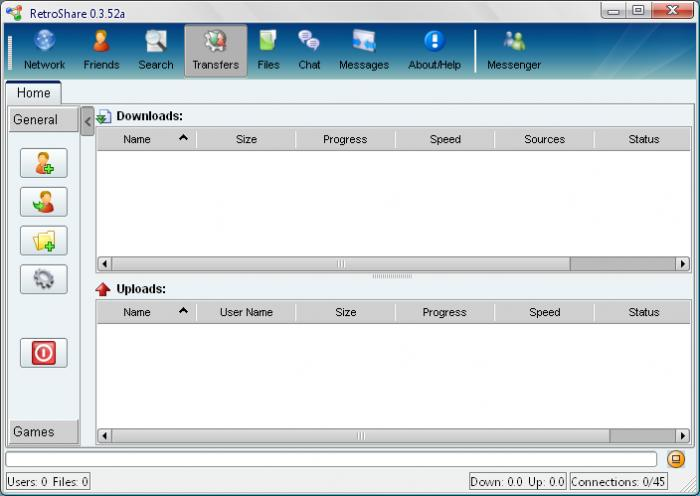 The File Listing will immediately appear in the File Transfer Window. Enter Your Message, Select who you want to send it to, and click "Send". The Message will be sent instantly to all those connected, and queued for the others offline. The Window displays a list of received massages. It allows you to Send/Reply or Delete Messages via the buttons on the left-hand side. 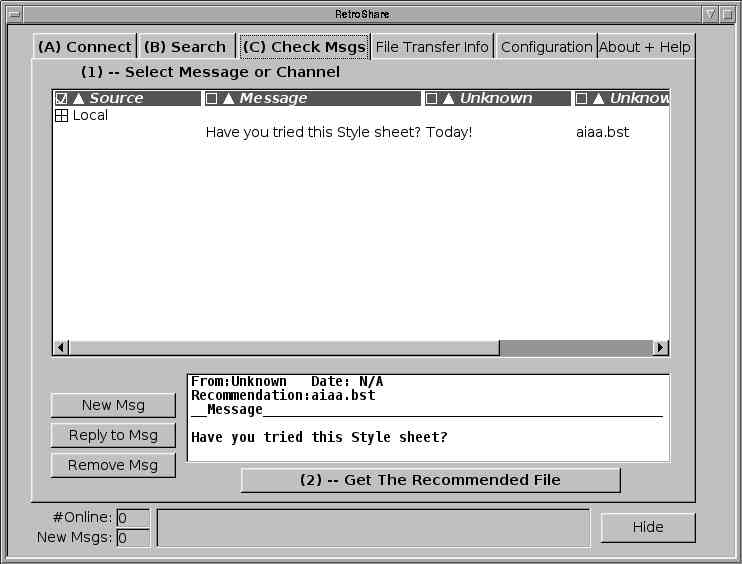 Recommendations can be downloaded by selecting the message, and then pressing the "Download" Button. You Can Also Open the "Universal Chatter Box" from here. This Tab allows you to monitor the current file transfers. Select a Transfer from the Top Window, and the details appear in the Lower Window. Cancel a Selected Transfer, by clicking on "Cancel Transfer"
Clear All the Completed Transfers, by clicking on "Clear Finished"
Set the Maximum Individual Rate for Uploads and Downloads using the the top field. Set the Total Maximum Data Rate using the scroll number below. The "Maximum Connections", or bottom field, is only eye-candy. If you are directly connected to the Internet (via broadband) then you should have Port Configuration set to auto. Ensure the the Box near the Top is Ticked. If you are behind a Firewall, and have opened a port through it. Then you should set your external address: Tick the "Firewalled", and the "Forwarded" Boxes. Enter your external address, in the field. Then press Change. If you are behind a firewall, and cannot open an external port, Tick the "Firewalled" Box. You can only make outgoing Connections. Add shared directories through the lower panel. 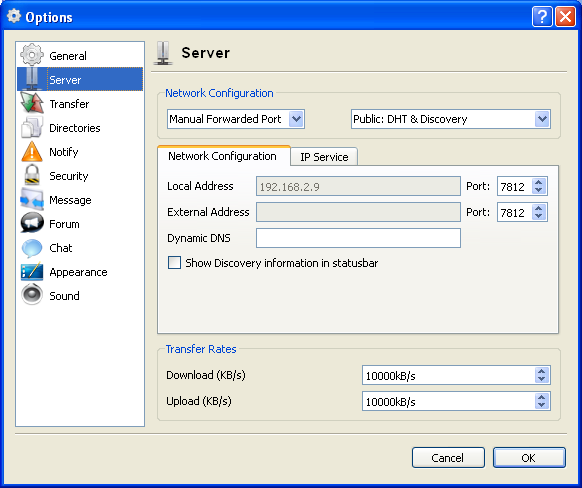 Ported the UDP Transport layer to Windows. Damn Microsoft make it hard to get the most basic of functionality to work! Finally completed the XPGP web of trust authentication system. Successfully tested it using a modified SSL3/TLS1 connection protocol. First successful NAT hole punching using the new UDP communication layer. Implementation of a SSL BIO layer is completed, and the first successful tests of a SSL connection over the UDP transport layer have been run! Basic proxy system implemented to get around firewalls. Standard SSL Hierarchical authentication scheme. SSL over TCP connections between peers. AutoDiscovery system to introduce you to others. Shared directories, searchable by your peers. 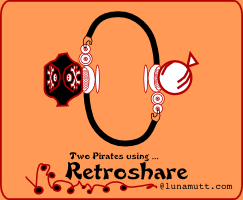 What is RetroShare? 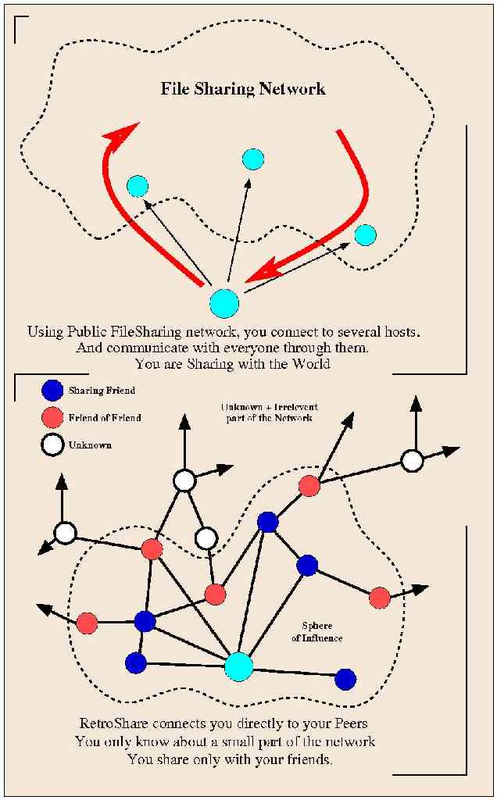 and Why another Peer to Peer Network? Current filesharing systems also suffer from bad quality of downloadable information. Often the filenames do not correspond to what you actualy get. You are getting (potentially random) information from a collection of random people. I want to share good information with, and only with, the people I trust. 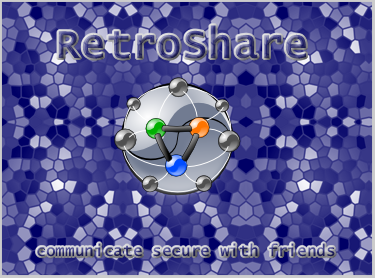 RetroShare is my solution to these problems: A simple filesharing program which connects you and your friends together for safe and secure sharing.